All three of us were kind of sick, so we did a short and familiar ride. Mission is really nice and smooth, and has some nice rollers. It looks like the 880 underpass on Warren avenue is closing for a year, so I guess this may be the last time we do this loop for a while. This is the third time we’ve done (at least part of) this ride. The first time was before we had the kid, early in our bike experiences. We started in Sunol, going up Foothill. After a while, before what we would not consider any real climbs, we decided it was too much and turned back. The second time was more recent, when Anne’s parents were in town to do some babysitting. That day we had six flats (including one on the descent) and one bloody nose. This time we started from home. We also approximated our full touring load — two big panniers on the back of my bike packed with food, a few bike tools, cold/rain gear, street clothes and shoes, etc. The big missing piece was extra water, since we don’t have the gear for that yet. Anne took the first turn with the trailer, and pulled Ruth all the way up the big hill. It was a pretty hot day, but there was a far amount of shade. Anne managed to sustain a faster pace than normal — maybe these training rides are starting to pay off. There was less bike traffic than I would have expected, although there was one woman on an electric-assist bike screaming up the hill. We were not impressed. At the summit, we stopped, caught out breath, and moved the trailer to my bike for the descent. It was fairly straight without many blind turns, so lots of fun. By the bottom, all my sweat had dried off. I was just about ready for lunch at this point, but there really aren’t parks or good places to pull off on these kinds of roads. We made it up to the 580 frontage road without finding a spot, which was very sunny. Finally we found a big of shade and pulled off the road on a narrow strip of concrete between the road and some barbed wire fence. Ruth was very good and stayed away from the ouchy fence. More sunny climbing, until we passed some ranch that was hosting some kind of rodeo, with lots of horses milling about. Then finally we made the turn back onto Foothill, with some shade. My legs and lungs were doing okay, but the heat made me feel a little lightheaded. 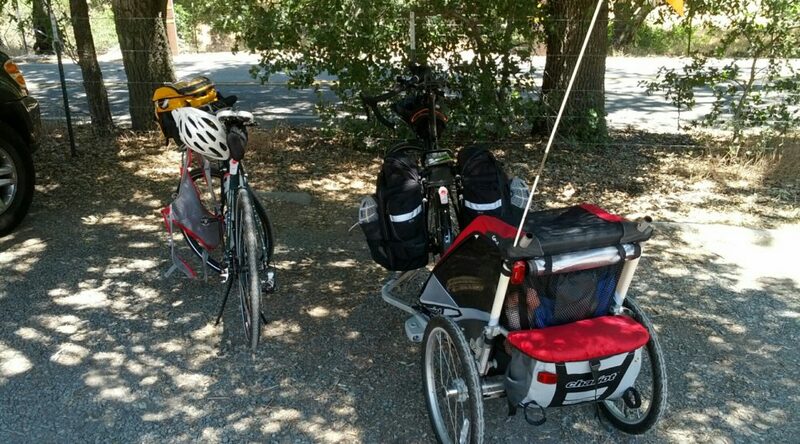 The rolling hills on Foothill were starting to take their toll, so at the Pleasanton Ridge park we switched trailers again (and refilled my nearly empty water). Ruth was napping, so she didn’t get to run around. Niles Canyon is fun, and mostly downhill westbound. There was a pretty strong headwind, though, which slowed us down. It stayed as a headwind when we made the turn onto Mission, which was pretty disappointing. The big panniers on my rear rack messed with my balance pretty bad, and made steering kind of twitchy. The descents were pretty straight, but I think it would make fishtailing with the trailer more likely. This will probably get worse once we add ~15 pounds of water for our days without any services. I think I need to figure out a front rack to get some more of the weight up there. Animal sightings: Horses, squirrels, a goat trying to climb a fence, some dogs, and one deer jumping through a field. Most interesting sports drink flavor: Tie between cucumber gatorade and some weird sports-beverage-in-a-tablet thing that Anne had from somewhere, that kind of tasted like watered down alka seltzer. We were originally going to load up cargo as if we were going on a real tour. My foot’s been bothering me a bit, though, so Anne suggested we skip that until next time. Then we forgot to bring one small pannier, which had all the cool weather gear. Instead of being a heavier-than-normal load, it was a extra-light load. Fortunately the weather was nice, so we didn’t need the clothes. This ride had two big climbs near the beginning of the ride. Anne took the trailer for both, including the descent in the middle. 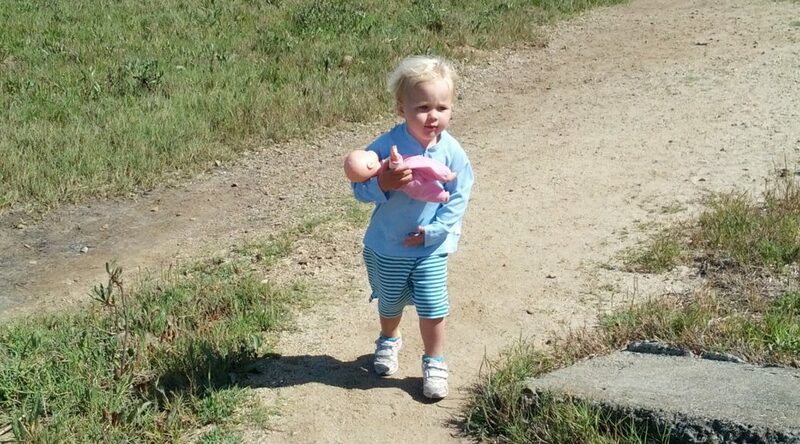 We ate lunch at Alpine Dam, which was pretty cool, except for needing to keep Ruth out of the (possible) poison oak. At the top of the second climb I took the trailer for the big descent. It was pretty windy and narrow, with a lot of blind turns. There was enough traffic to make it exciting, too. Then on to Highway 1, which we expected to be pretty flat. Turns out there was a moderate climb right away, which I wasn’t mentally prepared for and overexerted myself on. Once I started treating every incline as a sustained climb, things got better. Our turnaround point was Inverness, where we found a neat open area behind a general store. This seemed to be some kind of photographer hotspot, taking pictures of a wrecked ship and talking about what time of day or year provides the best lighting. The ride back to Fairfax included a nice multiuse trail through Samuel P Taylor state park. Sometimes these kind of trails have too many pedestrians or stop signs to really enjoy, but this one was pretty nice. There was even a woman taking her dog for a walk from horseback. In the last few miles of the ride, I started pooping out, so tricked Anne into taking the trailer again. It ended up only being a little bit more up a moderate hill, then a gentle descent for the last 2 miles or so. We ended up getting home pretty late, since this ride was a further from home. Ruth go pretty goofy — by the time we got home she was tickling busses and trucks. California State Items: California quail (State Bird), California poppy (State Flower), but sadly no State Mineral (gold). Worst parenting moment: Passing through a park with a playground without letting Ruth go play. I heard sad “playground playground swing swing” from the back for a while. Then there were some horses, and all was forgiven.